Contrary to mythology, barbecue was not an American invention. Barbecue is older than homo sapiens and anthropologists even think that it was mastery of fire that permanently altered our evolutionary path and it is this primeval link that makes us still love cooking over open flames. 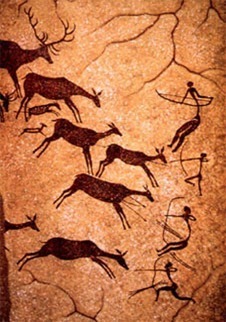 Around one million years ago Homo erectus, the homonid just before Neanderthal man, first tasted cooked meat. Nobody knows for sure, but here’s how I think it happened: A tribe of these proto-humans were padding warily through the warm ashes of a forest fire following their noses to a particularly seductive scent. When they stumbled upon the charred carcass of a wild boar they squatted and poked their hands into its side. They sniffed their fragrant fingers, then licked the greasy digits. The magical blend of warm protein, molten fat, and unctuous collagen in roasted meat is a narcotic elixir and it addicted them on first bite. They became focused, obsessed with tugging and scraping the bones clean, moaning, and shaking their heads. The sensuous aromas made their nostrils smile and the fulsome flavors caused their mouths to weep. Before long mortals were making sacrifices and burnt offerings to their gods, certain the immortals would like to try their heavenly recipes. Cooking makes it easier for animals to extract energy from food. That meant that there were more calories available for larger brains, which of course was an evolutionary advantage. It also took much much less time to eat, leaving time to hunt, socialize and form tribes and communities, and procreate. Evolution favored traits that enhanced the ability of these early homonids to hunt and eat cooked meat: Smaller hips and flatter feet for running speed, better hand articulation, communication skills, and smaller jaws. Eventually they learned to domesticate dogs to help with the hunt, and then they learned to herd and husband the animals that tasted best. 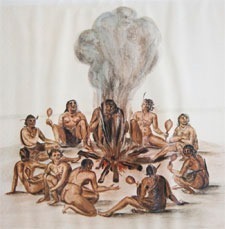 The family circle and tribal structure evolved so that men became hunters and women became cooks. Ergo, the first pitmasters were probably women. Eventually they built racks of green sticks to hold the food above the flames, and learned that the temperature was easier to regulate and the flavor better if the if they let the logs burn down to coals before the meat was put in place. Spit roasting is common around the world and for many years was the major barbecue cooking method. 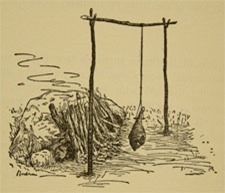 Baking an animal, vegetables, or bread in a hot pit in the ground was also an early development. Wooden frames were later used to hold meat over the fire, but they often held the meat well above the fire to keep the wood from burning, which resulted in the meat cooking slowly and absorbing smoke. The gridiron [similar to a grate on a modern grill] was developed soon after the Iron Age started, which led to grilling as we know it. Iliad, Book IX, Lines 205-235 and The Odyssey, Book III, lines 460-468 mention spits and five-pronged forks used to roast meat, basted with salt and wine at outdoor feasts in ancient Greece. 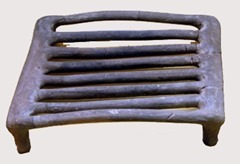 Such feasts at the end of a battle or long march were common throughout history.” Below is a grill from the Stoö of Attalus Museum in Athens in a photo by Giovanni Dall’Orto. It is estimated to be from sometime between the 4th and 6th century BC. Smoked foods not only tasted swell, they kept longer. We now know this is because there are antimicrobial compounds in smoke, because smoke drove off flies, and because slow smoking dehydrated foods and bacteria need moisture to grow. 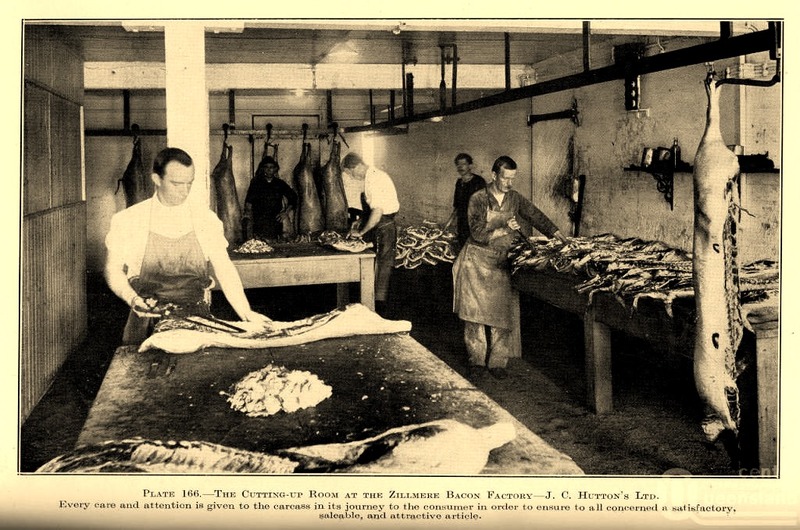 In the days before refrigeration, smoking, drying, and salting meat were clever strategies for preserving perishable foods. This allowed hunting tribes to make a kill and, unlike other animals, they did not have to gorge themselves before the prey spoiled. If they were migratory, they could smoke, dry, and salt foods and take it on the road with them. 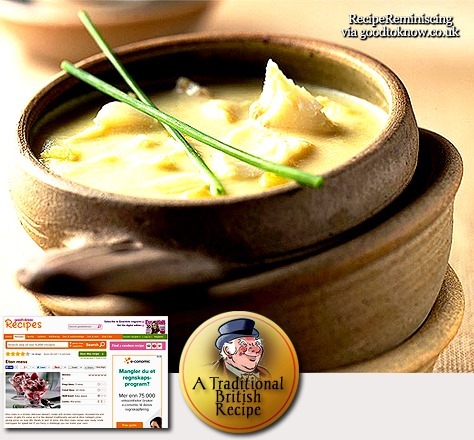 Cullen skink is a thick Scottish soup made of smoked haddock, potatoes and onions. An authentic Cullen skink will use finnan haddie (cold-smoked haddock, representative of a regional method of smoking with green wood and peat in north-east Scotland), but it may be prepared with any other undyed smoked haddock. This soup is a local speciality, from the town of Cullen in Moray, on the north-east coast of Scotland. The soup is often served as a starter at formal Scottish dinners. Cullen skink is widely served as an everyday dish across the northeast of Scotland. Local recipes for Cullen skink have several slight variations, such as the use of milk instead of water or the addition of single cream. Cullen skink was traditionally served with bread. It has been described as “smokier and more assertive than American chowder, heartier than classical French bisque. Cullen skink appears in many traditional Scottish cookery books and appears in numerous restaurants and hotel menus throughout Scotland, the UK, and internationally. In 2012 a Guardian columnist described the dish as “the milky fish soup which has surely replaced your haggises and porridges as Scotland’s signature dish”. Bacon or “bacoun” was a Middle English term used to refer to all pork in general. The term bacon comes from various Germanic and French dialects. It derives from the French bako, Old High German bakko, and Old Teutonic backe, all of which refer to the back. There are breeds of pigs particularly raised for bacon, notably the Yorkshire and Tamworth. 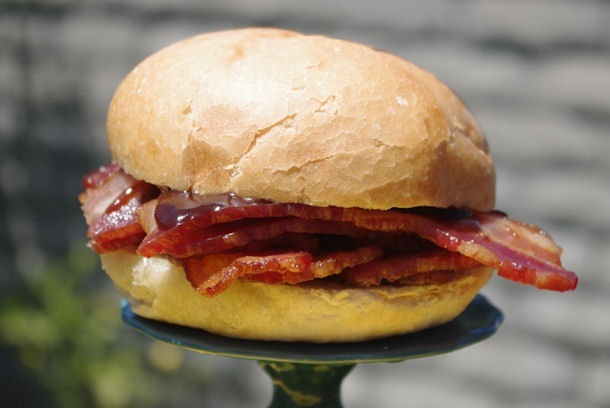 The phrase “bring home the bacon” comes from the 12th century when a church in Dunmow, England offered a side of bacon to any man who could swear before God and the congregation that he had not fought or quarreled with his wife for a year and a day. Any man that could “bring home the bacon” was highly respected in his community. Roman Era: According to food historians, the Romans ate a type of bacon which they called petaso, which was essentially domesticated pig meat boiled with figs, then browned and seasoned with pepper sauce. 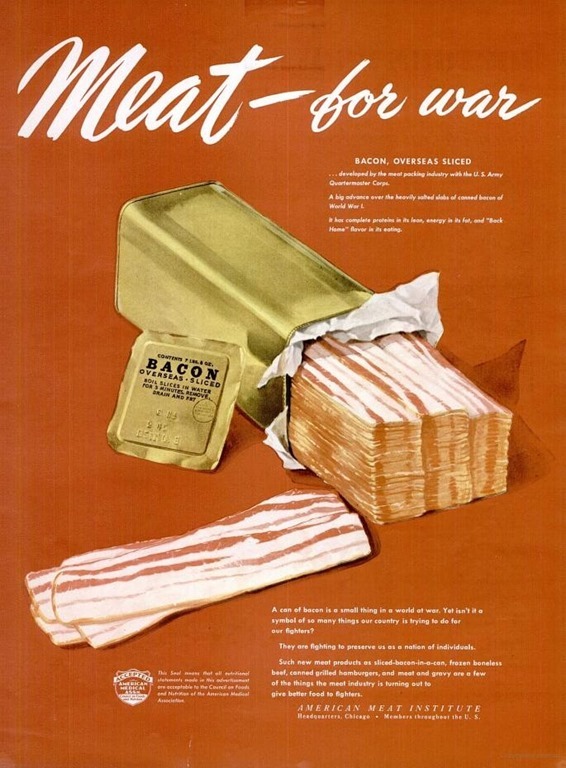 1600’s: Bacon, a relatively easy to produce and cheap meat source, becomes a staple for European peasants. Smoked Bacon is considered the highest quality. 1770’s: John Harris, an Englishman, is credited as the forefather of large scale industrial bacon manufacturing. 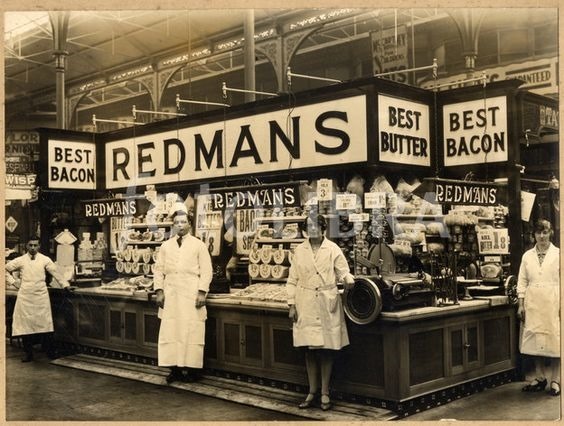 He opened his company in Wiltshire, still considered the bacon capital of the world. 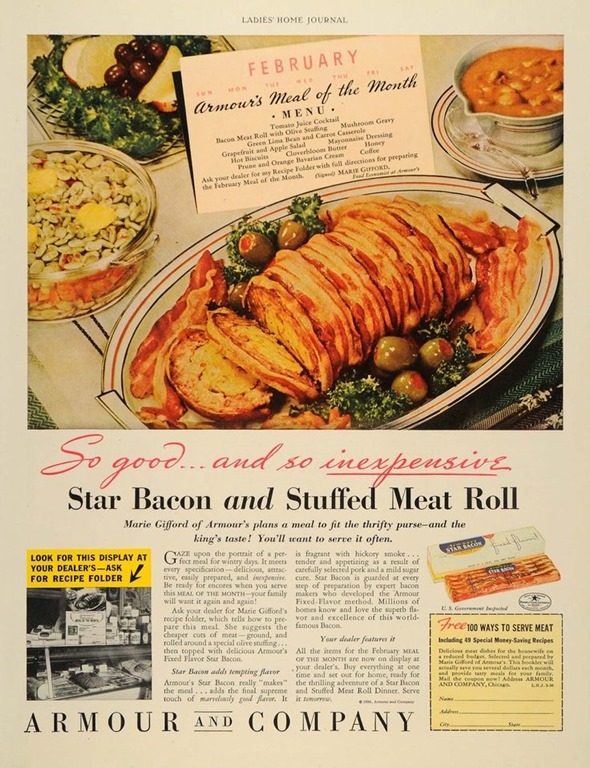 1924: Oscar Mayer introduces pre-packaged, pre-sliced bacon to America. 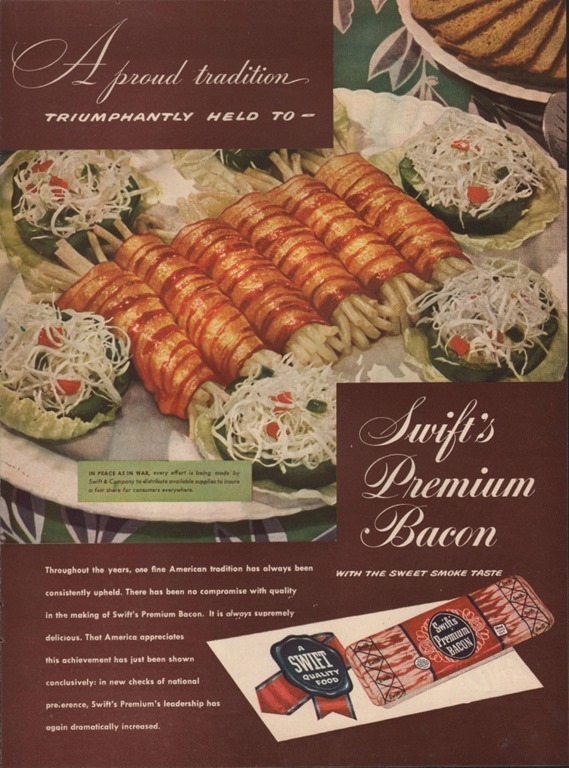 21st century: Bacon has become super popular, with mebsites, blogs, a Wikia (Hey! look at me! ), t-shirts and a plethora of products all appreciating the goodness that is Bacon. Bacon is one of the oldest cuts of meat in history; dating back to 1500 BC. In the 16th Century, European peasants would proudly display the small amount of bacon they could afford. The Yorkshire and Tamworth pigs are bred specifically for bacon. 70% of all bacon in the US is eaten at breakfast time. More than 2 billion pounds of bacon is produced each year in the US. 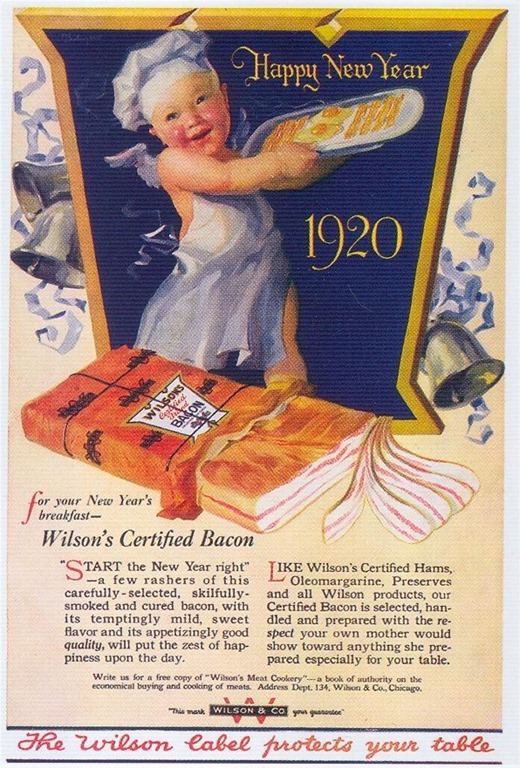 Until the first world war, bacon fat was the cooking fat of choice in most US households, when prepackaged pig lard became commonly available. Bacon is a meat product prepared from a pig and usually cured. It is first cured using large quantities of salt, either in a brine or in a dry packing; the result is fresh bacon (also known as green bacon). Fresh bacon may then be further dried for weeks or months in cold air, or it may be boiled or smoked. Fresh and dried bacon is typically cooked before eating, often by frying. Boiled bacon is ready to eat, as is some smoked bacon, but may be cooked further before eating. Bacon is prepared from several different cuts of meat. It is usually made from side and back cuts of pork, except in the United States and Canada, where it is most commonly prepared from pork belly (typically referred to as “streaky”, “fatty”, or “American style” outside of the US and Canada). The side cut has more meat and less fat than the belly. Bacon may be prepared from either of two distinct back cuts: fatback, which is almost pure fat, and pork loin, which is very lean. Bacon-cured pork loin is known as back bacon. Bacon may be eaten smoked, boiled, fried, baked, or grilled and eaten on its own, as a side dish (particularly in breakfasts in North America) or used as a minor ingredient to flavour dishes (e.g., the Club sandwich). Bacon is also used for barding and larding roasts, especially game, including venison and pheasant. The word is derived from the Old High German bacho, meaning “buttock”, “ham” or “side of bacon”, and cognate with the Old French bacon. In contrast to the practice in the United States, in continental Europe these cuts of the pig are usually not smoked, but are instead used primarily in cubes (lardons) as a cooking ingredient, valued both as a source of fat and for its flavour. In Italy, this product is called pancetta and is usually cooked in small cubes or thinly sliced as part of anantipasto. Meat from other animals, such as beef, lamb, chicken, goat, or turkey, may also be cut, cured, or otherwise prepared to resemble bacon, and may even be referred to as “bacon”. Such use is common in areas with significant Jewish and Muslim populations, both of which prohibit the consumption of pigs. The USDA defines bacon as “the cured belly of a swine carcass”; other cuts and characteristics must be separately qualified (e.g., “smoked pork loin bacon”). For safety, bacon may be treated to preventtrichinosis, caused by Trichinella, a parasitic roundworm which can be destroyed by heating, freezing, drying, or smoking. Bacon is distinguished from salt pork and ham by differences in the brine (or dry packing). Bacon brine has added curing ingredients, most notably sodium nitrite, and occasionally potassium nitrate (saltpeter); sodium ascorbate or erythorbate are added to accelerate curing and stabilise colour. Flavourings such as brown sugar or maple are used for some products. 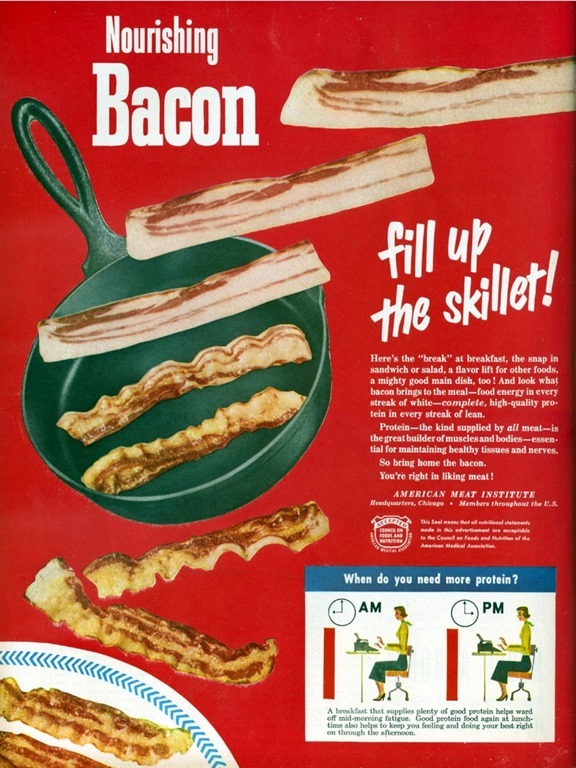 Sodium polyphosphates, such as sodium triphosphate, may be added to make the produce easier to slice and to reduce spattering when the bacon is pan-fried. Today, a brine for ham, but not bacon, includes a large amount of sugar. Historically, “ham” and “bacon” referred to different cuts of meat that were brined or packed identically, often together in the same barrel.